Mānele and Hulopo‘e are adjacent bays on the southern coast of Lāna‘i. Take Hwy 441 eight miles from Lāna‘i City to the coast. Parking is available at either bay. If arriving by boat to Manele Harbor, Hulopo‘e Bay is about a 10 to 15 minute walk. The MLCD is divided into two subzones. 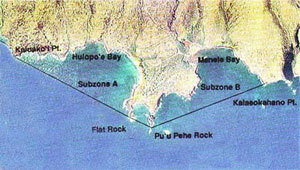 Subzone A extends from the highwater mark seaward to a line from Kaluako‘i Point to Flat Rock, then to Pu‘u Pehe Rock. Subzone B extends from the highwater mark seaward to a line from Pu‘u Pehe Rock to Kalaeokahano Point. Mānele and Hulopo‘e Bays are separated by a volcanic cone, eroded on the seaward edge to form Pu‘u Pehe Cove. A sea stack, Pu‘u Pehe Rock, is located just offshore of the cove’s left point. The ruins of the ancient fishing village of Mānele extend from the area just inland of Mānele Small Boat Harbor to Hulopo‘e Beach Park. Within Mānele Bay corals are most abundant along the sides of the bay near the cliffs, where the bottom slopes off quickly to about 40 feet. The middle of the bay is a sand channel. Just outside the western edge of the bay near Pu‘u Pehe rock is “First Cathedrals”, a popular SCUBA destination. Hulopo‘e Bay has large tidepools at its left point. A shallow reef is just offshore, providing excellent snorkeling opportunities. Pu‘u Pehe Cove has clear water and considerable marine life. Coral growth is interspersed with sand patches, and most coral is found away from the narrow beach in about 10 to 15 feet of water. All areas can have dangerous swells and currents during southern (kona) storms. Access to Pu‘u Pehe Cove is dangerous. The cliffs are steep, and the loosely packed lava results in unstable footing. Boat traffic is common in Mānele Bay. Restrooms and showers at Mānele and Hulopo‘e. To fish for, take, or possess any finfish or ‘a‘ama crab by pole-and-line from the shoreline only. To possess the following gear: pole-and-line, one knife, one hand net with frame no more than 3 feet in diameter (excluding handle), any legal fishing gear while on a vessel transiting to or from Mānele Boat Harbor within the harbor channel or the harbor, but that fishing gear may not be in the water. With a permit, to engage in activities otherwise prohibited by law for scientific, for propagation, or other purposes. To fish for, take, or injure any marine life (including eggs), except as indicated in “Permitted activities” above. To operate, anchor, or moor a vessel in such a way as to damage marine life or geological features anywhere in the MLCD.